“The Ronda Rousey Show” makes its way to Hollywood this weekend, with UFC 184 taking place in Los Angeles’ famed Staples Center. The champion, a blossoming pop culture star that has become one of the most brutal finishers in the sport of mixed martial arts meets Cat Zingano for her fifth consecutive UFC women’s bantamweight title defense. Pundits will suggest “Alpha” is the toughest test of Rousey’s career, while general followers have heard it all before, and may not even agree with that assessment. Rousey, who is currently as high as a -1000 on the betting lines, hasn’t faced much trouble inside the Octagon, apart from defending a rear naked choke attempt by Liz Carmouche in her first UFC fight (UFC 157) and fighting three rounds against Miesha Tate in a competitive yet lopsided bout in their second duel (UFC 168). It’s not like Zingano hasn’t defied the odds herself inside the cage, apart from making an inspiring comeback after the death of her husband, Mauricio Zingano, in early 2014. The Colorado native was down on the scorecards by two rounds at The Ultimate Fighter (TUF) Finale 17 in early 2013, before scoring a stoppage over Tate in the third frame of their 135-pound number one contender’s bout. After the personal tragedy and a grueling knee injury that kept her on the sidelines, Zingano pummeled Amanda Nunes at UFC 178, after enduring much of the beating herself in the early stages of the fight. If there’s anyone that can overcome adversary and welcomes a dogfight, it’s Zingano. That said, Rousey has become more than just a submission expert as of late. The sometimes-movie star and swimsuit model is on a reign of terror when it comes to stoppages, never going to a decision in her undefeated 10-fight career, having wasted both Alexis Davis (UFC 175) and Sara McMann (UFC 170) in her last two fights (with a combined fight-time of 1:22). It’s a compelling fight, yet one the champion is supposed to win. But what happens afterwards? It wouldn’t be unfair to say Rousey completely dominated the division and its members, and with her unique widespread appeal and countless offerings that come up for professional athletes, retirement has been suggested. It would be a little farfetched to assume so, since “Rowdy” may not even be in the prime of her career at 28 years old, hence her newfound success in the standup department. Interestingly enough, the co-main event features pro boxing standout Holly Holm making her debut against TUF 18 cast member Raquel Pennington in another women’s bantamweight showdown. Holm is currently riding a seven-fight winning streak, where her standup has helped her earn six victories by way of either knockout or TKO. 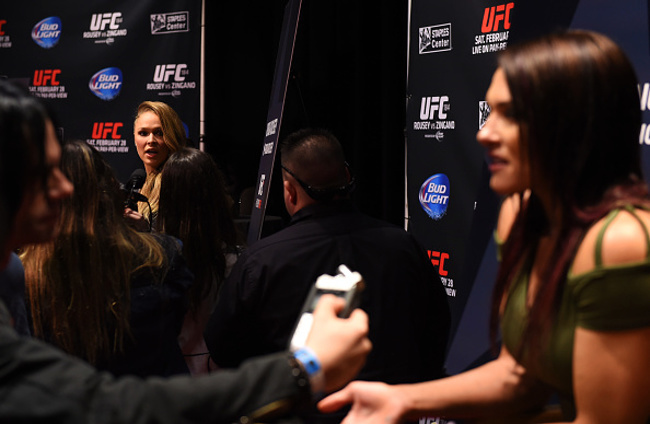 Many feel like Holm could be Rousey’s next foe should she take home the victory on Saturday, and considering entertainment and booking purposes, it would probably happen. The same can’t be said for Pennington if she wins (who would improve to 5-5), but TUF 18’s Team Tate member would certainly throw her name into the mix. Ironically, Holm commented earlier this week the division “would benefit greatly” with a Rousey loss, citing that everybody would believe in herself in terms of being No. 1 in the world. To be fair, Holm was presumably insinuating that it would open up the air at 135 pounds, and have Rousey believe she would be on equal pairing with her counterparts. Stemming from UFC President Dana White’s comments that his women’s bantamweight titleholder would have to start fighting men with a win, the promotion for a Rousey vs. Holm fight could have already started (it’s also hinted at in UFC Embedded: Episode 3). This seems like the most obvious option, should Rousey win. However, there are a number of other alternatives, should the game be changed on Saturday night. A Rousey loss is simply not expected to happen in California this weekend, but the world of combat sports is full of surprises. Remember, the women’s bantamweight division was built around the sole purpose to have “Rowdy” compete in the UFC. The UFC’s head honcho was skeptical about having women compete in the organization, saying he wouldn’t allow it when questioned in 2010 and 2011, only to sign Rousey in 2012 after she went 6-0 in Strikeforce, including a title win and a title defense against the accomplished Sara Kaufman in the summer of that very year. If Rousey had never existed, maybe the inclusion of women in the UFC would have taken longer, yet their induction would have been a foregone conclusion. Strikeforce was already putting on compelling women’s MMA bouts (don’t forget Cristiane Santos against Gina Carano headlined a Strikeforce card in 2009, marking the first time two women would main event a major MMA event,) and Invicta FC was on the rise, putting on its first three events in 2012. Plus, UFC formed a partnership with Invicta FC to hold a women’s strawweight tournament, signing a crop of its fighters to participate on TUF 20, in order to crown the inaugural women’s strawweight champion. It was the second season women would participate on TUF, and to that respective division’s credit, it’s more stacked than the women’s bantamweight division at the moment. Much of Rousey’s popularity was largely due to her feud with “Cupcake,” and their first fight in early 2012 at Strikeforce: “Tate vs. Rousey.” Rousey was destroying her opposition on Strikeforce: “Challengers” cards, becoming an armbar phenom having defeated four veterans in a row. After she made short work of Julia Budd in late 2011, she was awarded the title shot against Tate, and Rousey showed how sharp she could be in the psychological game, engaging in a war of words with Tate that stole the show at the pre-fight press conference, where fighters like Josh Thomson, Paul Daley, K.J. Noons, and Ronaldo Souza were overshadowed (it didn’t stop after the fight was over, either.) If anything, this rivalry—which would boil over to the UFC for a rival coaching gig at TUF 18 and a second title fight in late 2013—really helped Rousey generate popularity. It all came down to what she did while fighting, although Tate should be credited for her inclusion in helping the show hit the road. She may not be as consistent as she’d like to be, yet Tate’s popularity is growing with fans, as we saw when she stood across the cage from McMann at UFC 183 while the crowd stood behind her and decided to show limited support for the cheerful and generally appreciated Olympian. While Rousey has submitted Tate by armbar twice, UFC won’t waste the opportunity to have a trilogy bout between both competitors, should Tate keep winning (she’s won her last three contests) and the challenges keep diminishing, Rousey-Tate 3 isn’t unworkable, whether the champion has the gold around her waist or not. One thing worth bringing up is boxing’s crowning achievement to have Floyd Mayweather and Manny Pacquaio finally trade fisticuffs in May, whether or not their superfight has lost some muster over the years. Another supposed MMA superfight, one that involves Rousey against “Cyborg” (Justino), seems more possible than ever should the Brazilian defeat Charmaine Tweet at Invicta 11 in a featherweight bout. The history between these two fighters goes back to their Strikeforce days, yet nothing ever materialized. Justino had doctors tell her she’d risk life going down to bantamweight in the past, which spawned criticism for Rousey. Matters got worse when Justino tested positive for banned substances in late 2011 and stripped of her Strikeforce women’s featherweight belt, where she was ridiculed by the champ, and it ruled out any possibility of this fight happening on Zuffa soil. However, rumored negotiations with UFC owner Lorenzo Fertitta (who is considered to be interested in signing the Brazilian) could see Justino fight for the UFC, should she win as a -1425 favorite this very weekend under a promotion with ties to the UFC. It’s also worth saying Justino passed her pre-fight drug tests (administered by the California State Athletic Commission for her fight in the same city as UFC 184,) and barring more weight issues should they arise (she was supposed to make her bantamweight debut at Invicta FC 10 before an injury forced her off the card,) “Cyborg” could be a UFC fighter before the year’s end. It seems unfair to compare this superfight to the one announced in the sport of boxing, but with Silva, Georges St-Pierre, and Jon Jones out of the superfight picture, this offering could heighten women’s MMA and the UFC’s popularity even further with a grudge match that may come too late. After all, they still talk about each other, and a meeting seems inevitable considering UFC.com isn’t shying away from reporting the feud. But this is all speculation as to who Rousey's next opponent could be with a victory. If she loses, it’s hard to predict what exactly would be different, considering Rousey would earn an immediate rematch (no matter how she tastes defeat.) It’s hard to argue it wouldn’t open up the division, but it’s not like Rousey would disappear after her first defeat, let alone get another shot in an incredibly marketable rematch. There aren’t many options outside the ones previously mentioned, besides rematches against Davis, McMann, or Kaufman (forced ones at that), or a bout against Bethe Correia, who has built a rivalry with Rousey’s Four Horsewomen stable. Still, that fight doesn’t seem as appealing as the rest of them, and Correia may not be as deserving at the moment. So, what exactly changes with a Rousey loss, apart from the title being swapped to another competitor? 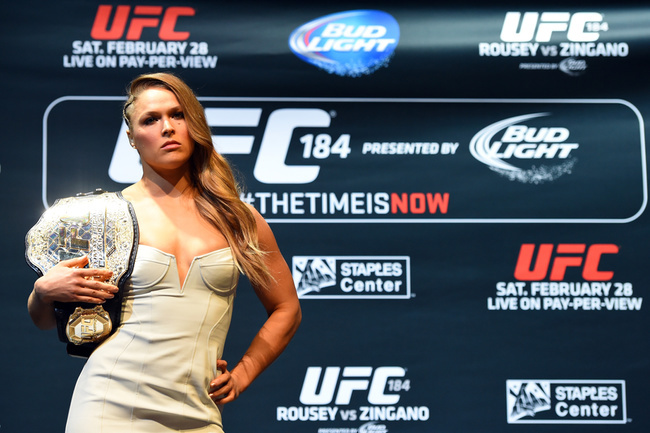 It would be the dawn of a new era, yet one that could be short-lived should Rousey be granted the inevitable rematch. If Rousey wins, there are only three options worth considering, with Holm at the forefront (with a co-main event win) due to already being under the UFC banner and hype generated for a boxer vs. grappler showdown. Either way, it has nothing to do with women’s MMA in the UFC, which has been prosperous, despite the need for more top-level signings and more fights. 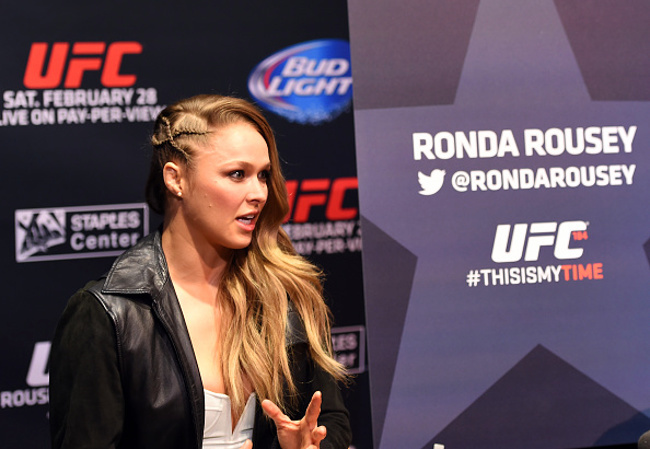 You can thank Rousey for that, though in terms of her own career, win or lose, the show must go on, and will go on.